Sometimes, a real life story comes along that is so unique, so wonderful that someone must tell the story as it really happened. This is a story of a woman that has such a unique gift! It has been suspect for more than thirty years ...I suspected she had the special gift all our married life! She would just look at our family pet, and tell me it was sick and we must take it to the vet. Or, she could tell when these animals are happy, sad or hungry. In the past, I just put it off as her wonderful love of animals. Then one day my youngest son bought my wife a special GIFT...a baby horse! This horse isn't any horse! It is a special horse, a horse that will open up your eyes to The wonderful World of Magic. If you still believe that Fairy Tales are real! You just have to read this book! About Robert E. Gossard (Author) : Robert E. Gossard is a published author of children's books. 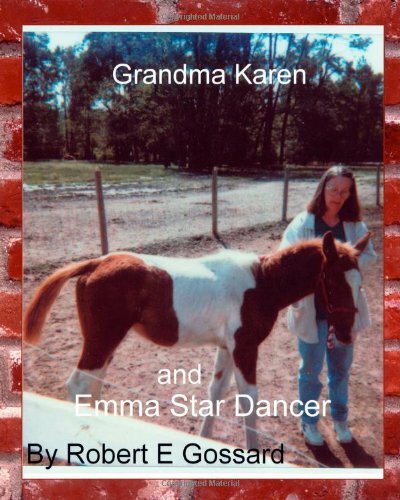 Published credits of Robert E. Gossard include Grandma Karen and Emma Star Dancer, Grandma Karen and Emma Star Dancer.